In July, 2012, the Society received an important Civil War document from an anonymous donor, who offered the gift in honor of Father Don McAllister, a historian born and raised in Norway. The document is especially significant because it concerns raising funds, so a Norway soldier could come home on furlough. The 1863 document contains the pledges of many prominent Norway citizens, to provide financial assistance to native son Wellington Hobbs, enabling him to travel to Norway from Virginia. 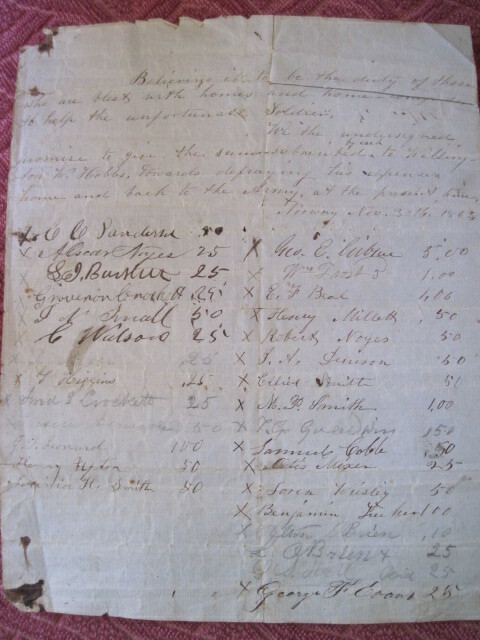 Believing it to be the duty of those who are blest with homes and home-comforts to help the unfortunate Soldier, We, the undersigned, promise to give the sum subscribed by each to Wellington Hobbs towards defraying his expenses home and back to the army at the present time. Norway, Maine November 30th, 1863. Captain Wellington Hobbs was born in Norway, Maine, 25 December 1844, the son of Jeremiah Wellington Hobbs and Fanny O. Greenleaf. The family lived in a dwelling on the corner of Main Street and Greenleaf Avenue, a home destroyed in The Great Fire of 1894, and after being rebuilt, a fire in 2009. He was the grandson of Jeremiah Hobbs of Hopkington, Massachusetts, one of the first 6 men to come into the area in 1786 to fell timber for a homestead on Rustfield’s Purchase. 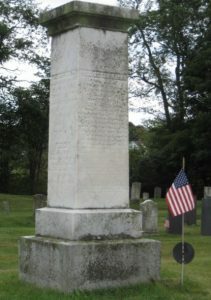 Wellington Hobbs volunteered and was mustered into the First Regiment Maine Volunteer Militia, Company G, Captain George L. Beal of Norway, Commander, at Portland, Maine, on 3 May 1861, for a 3-month enlistment. The Maine Adjutant General Reports list him as the company musician. At the end of the enlistment period Hobbs did not volunteer for the Tenth Volunteer Maine Militia as many others from the Maine First did, but later mustered into the Seventeenth Regiment Maine Volunteer Militia at Cape Elizabeth, Maine, 18 August 1862 and was assigned to Company G as a corporal, and later promoted to sergeant. He was later assigned to Company H and on 11 December 1863 was commissioned 2nd Lieutenant, and promoted to 1st lieutenant on 14 March 1864. He was killed while on the picket line before Petersburg on 24 October 1864; his commission for the rank of Captain arrived the day after he was killed. 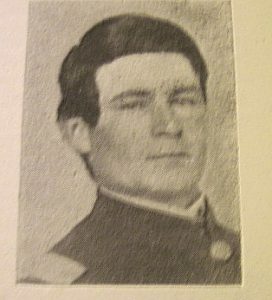 Captain Hobbs had to have been one of the youngest Captains in the Union army. He died 2 months and one day before his twentieth birthday, and he rose through the ranks through personal skill and competence. The date on the document subscribing money to be raised to bring Hobbs home on a short furlough is dated November 30th 1863, 11 days prior to his commission as a 2nd Lieutenant. In his centennial history of Norway, William Lapham says of the Seventeenth Regiment Maine Volunteer Infantry that it was one of the best regiments in the service, and that while it did not join the Army of the Potomac in time to take part in the earlier battles of the war, while it did serve, no Maine infantry regiment took part in more engagements, and none conducted itself with greater coolness and bravery. Captain Hobbs’s gravestone in Rustfield Cemetery, just around the corner from his childhood home. The society gratefully thanks the donor for their generosity by giving us this poignant and important piece of Norway history.